Greetings again from the darkness. Counting the original in 1968, this is the ninth Planet of the Apes film (sourced from the Pierre Boulle novel), and the third in the most recent reimagining – including Rise of the Planet of the Apes (2011) and Dawn of the Planet of the Apes (2014). That’s almost 50 years of talking apes questioning the role, purpose and intent of humans. Director Matt Reeves (Let Me In, Cloverfield) is back after ‘Dawn’ and clearly has an affinity for the characters and the continuing saga. This one is by far the most personal … if that’s the right term when applied to a species other than persons! 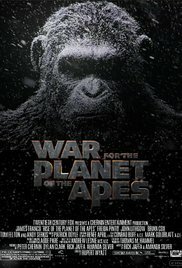 Opening with the film’s best battle scene (and perhaps the most superb and vivid of the franchise); the film stuns us with the realism of apes on horseback and searing violence that rivals any war film. We are immediately drawn in by the thrilling and intimate battle scenes, and the accompanying adrenaline rush. It’s a beautiful and heart-pounding opening that will surely satisfy even the most demanding action-oriented fans. This is also when we notice that Michael Giacchino’s score as a complementary thing of beauty and not just more over-the-top action film music bravado. The great Andy Serkis returns as Caesar, the leader of the apes, and dare I say, one of the most exciting and dynamic recurring characters in the movie universe. This third film belongs to Caesar and we see his intelligence, personality and skills have evolved in each. His human nemesis this time is Woody Harrelson in Colonel Kurtz psycho-war lord mode. In the years since Dawn of the Planet of the Apes, a simian virus has wiped out much of the human race and now the last two human factions (one led by Harrelson) are preparing for a final epic war, while at the same time, all remaining humans are united against apes. Apes simply want to be left alone in the forest, but humans focused on their destruction are forcing the apes to fight. One particular attack causes Caesar to erupt in anger and strive for revenge, providing the foundation for a movie with less action than the previous two, and a more concerted focus on story and character. Some may be disappointed in this. Others (like me) will find it fascinating. Joining Serkis/Caesar for a third round are Terry Notary as Rocket and Karin Konoval as Maurice (orangutan). Also returning is Toby Kebbel as Koba – this time in a manner that really messes with Caesar’s mind. Steve Zahn steals his scenes as the comedy relief chimp known only as “bad ape”, with Judy Greer as Cornelia, and young Amiah Miller as Nova (same name as Linda Harrison in the original). Nova is a human girl who seems to fit much more with the apes than the warmongering humans. Fans of the original will also note Caesar’s son is named Cornelius (the same as Roddy McDowell’s ape in the original). Director Reeves delivers what would be a fitting end to a trilogy, but there is likely to be yet another if fans can appreciate that the series has evolved every bit as much as the apes. This entry was posted on Wednesday, July 12th, 2017 at 8:24 pm and is filed under Action, Fantasy, Thriller. You can follow any responses to this entry through the RSS 2.0 feed. You can leave a response, or trackback from your own site. Thanks Ray. I believe fans of the series will be fans of the movie.